Just 3 Rows from the Beach! 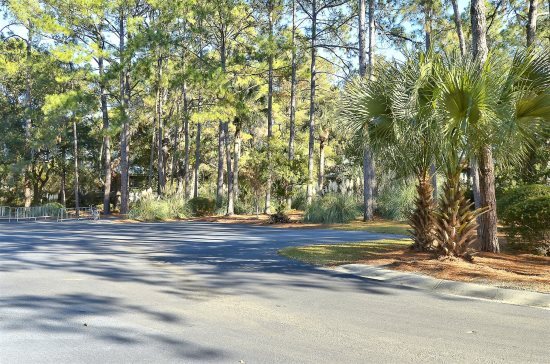 5 Bedroom 3 bath Home on Dune Lane in Forest Beach Hilton Head! 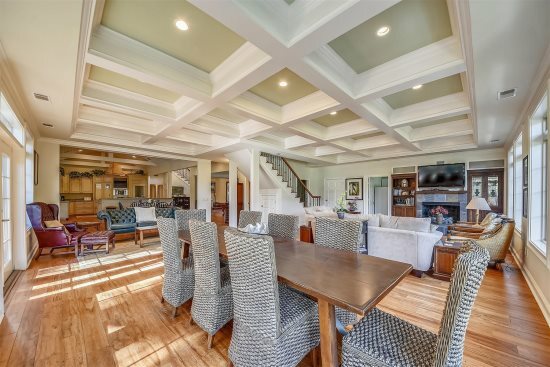 Beautifully decorated home that will delight you to the core, this property has enough room for 14 guests. Take a dip in the private pool, relax in the back or the front yards where there is seating to enjoy the pool in the backyard or the fire pit out front. Climb up to the widow’s walk and get a glimpse of the ocean while you watch the stars come out; or enjoy being above the tree tops! You can even have cocktails up there and enjoy the conversation area. Enter this home by the garage into the foyer which is open and spacious. Four steps down and you will enter the great room. This great room incorporates 2 dining areas with 2 tables with six chairs each, and the other seating is at the bar, 4 on one side and 2 on the other. That’s a total of 18! So, take your pick and be comfortable, no one is cramped when it comes to dining here. The main living area offers a sectional sofa and two comfy leather chairs, enjoy the large flat screen TV and pop in your favorite movie! Play games at one of the dining tables and enjoy eating meals together once again. Just through the sliding glass door, there is a fire pit out front with a cozy wicker love seat, and multiple chairs for a fun gathering or making s’mores with the kids. Around back, there is a pool and more lounging furniture. The yard is mostly fenced if you’d like to bring up to 2 well behaved dogs. They love to go on family vacations too! On this same level, there is a large laundry room with a full-size washer and dryer and plenty of room for your golf clubs! Down the hall, you’ll encounter 3 bedrooms and 2 full baths. The first bedroom has a king bed and comfortable furniture, tastefully done in white. The middle bedroom has 2 bunk beds for the kids, sleeping a total of 4 in this room. There is a hall bath with a stand-up, walk-in shower for these two bedrooms to share. The master suite on this same level, has a king sleigh bed and a large flat screen TV, a separate dressing area, and a bath with a walk-in shower (no tub). The other bedrooms are upstairs. On the second floor, there is another master suite with king bed, private bath with a separate tub, a walk-in large shower and a vanity with his and her sinks. This bathroom was recently completely renovated and has an abundance of natural light and large mirrors. Up another set of stairs is a reading nook and then a few more steps up is an office space for those who have to keep in touch with the real world, or just want to surf the web. A double bed is just a few more steps up and here is where we have access to the roof top area and widows walk. 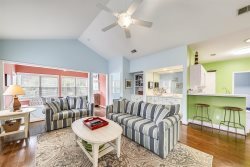 Enjoy the views and the privacy of this lovely home on your next vacation to Hilton Head Island. Parking in the garage for two and in front for two more.